What privacy settings are available on Chatango? 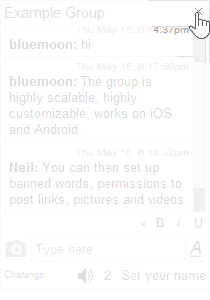 What moderation controls are available in Chatango? How can my child disable Chatango on a site she visits? How can I block my child from using Chatango? A user must be at least 13 years old to use Chatango. If a signed up Chatango user tries to start a conversation with a user with no age set, or an age below 18, the person initiating the chat will be asked to enter their age. A user must be at least 13 years old to use Chatango. The most reliable way to restrict your children's internet use is to install Parental Control software on their computer, that will restrict them from visiting certain websites that you can choose. A table of comparison of Parental Control Software. If you are on Windows 8, certain Parental Controls are already built in. You can also block websites on Windows Vista and Windows 7 for Internet Explorer 7 or later.